I'm finally back in the groove after our six-day trip to England just over a week ago. Spending so much time away from the kids was at times complete bliss and at other times a bit emotional. To keep us from missing them too much, and to harken back to our childless travel days, we kept busy and stayed on the move. We didn't even let six inches of snow get in our way when we made plans to explore Cambridge, which was about a 45 minute drive from where we were based all week. And while walking around might have been more pleasant had we packed our snow boots and without pellets of ice smacking us in the face, the photos I was able to capture of this already picturesque area were well worth it. This is Christ's Pieces Park. We took a bus into the heart of the city, which I highly recommend doing even if you are getting around England by car like we were. 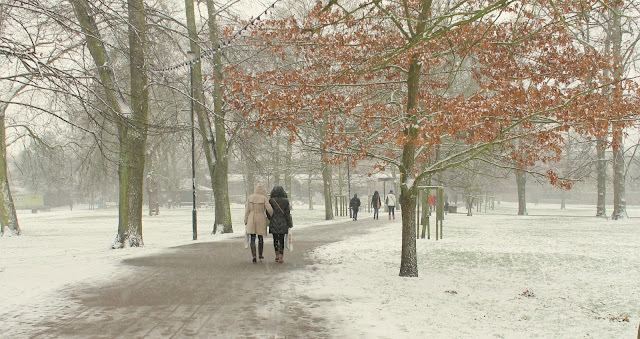 This green space (or white, in our case) is just steps from the bus station (and makes it easy to find when you need to board your return bus). The beauty of the winding River Cam was pretty stunning, especially with the snow-heavy willow trees bending over it. Had the weather been warmer, it would have been really fun to pack a picnic and spread a blanket at the area across the river, called The Backs. Some visitors were brave enough (foolish?) to embark on a punting tour, something Cambridge is famous for. While I consider myself a fairly hardy Midwesterner, I watched the boats go by from the warmth of a cozy pub, sipping a British ale. Before heading toward the campus itself, we admired the famous Mathematical Bridge. Although not actually designed by Sir Isaac Newton, a tale that was often told to gullible tourists, it does have a significant archetectural component to it. While it may appear to be an arch, it is made entirely of straight timbers. Just looking at these pictures and remembering the day makes me want to brew a pot of tea and warm up. So I'll share our adventures walking around the Cambridge campus next week! This post is a part of Friday Daydreamin' at R We There Yet Mom and Photo Friday at Delicious Baby. Beautiful pictures. I always enjoy the snow more when I'm inside my warm home, watching the falling snow outside or looking at pictures. :)Let's just say I'm not a fan of cold. 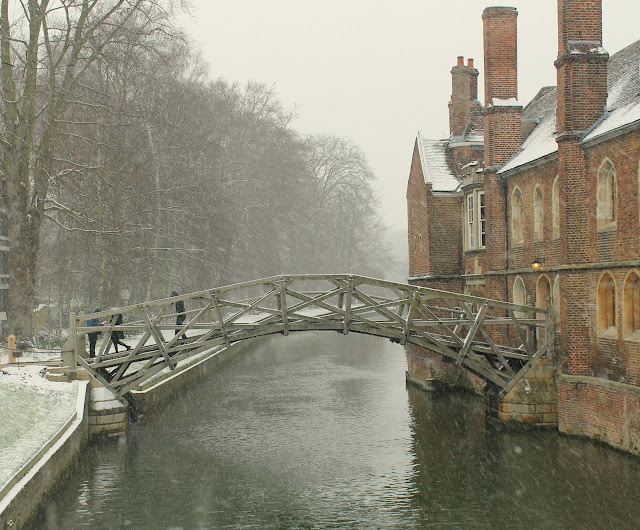 The mathematical bridge is really neat. I loved that picture. Not exactly the images that come to mind when I think of Cambridge - but beautiful nonetheless! Glad you had such a nice time away! 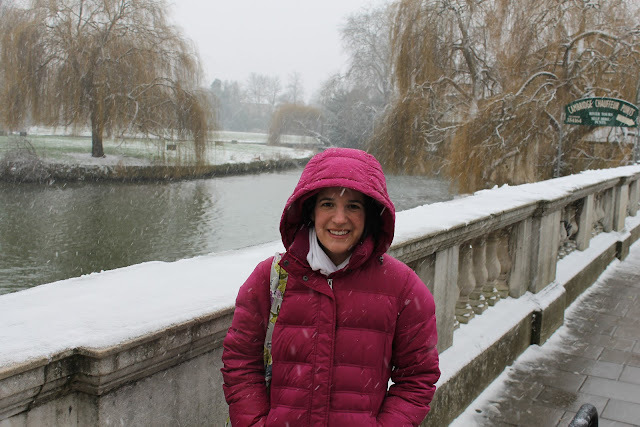 Thank you for the tour of Cambridge - it looks so cold but i loved learning about the park and the bridge - it sounds like you had a wonderful trip! Thank you for linking up this week! Sorry it took me so long to get around. Hope it was one of the unforgettable travelling experience you ever had. But I think exploring in the snow is really hard, you’ll have taken up a big challenge. That bridge is really beautiful, there something about it that ticks me. I would love to take a ride in one of those boats. Big City Travel with Kids Tip: Visit the Library!